In case you were wondering where I may have been, here goes nothing! YAY!!! 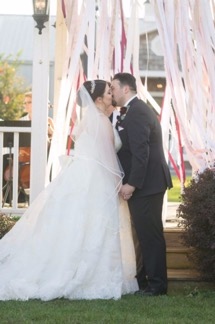 My husband Jason and I wed in October in a beautiful ceremony surrounded by friends and loved ones. Even Colin was there! It was amazing, and I loved every minute of it. It took a lot of energy and time, but was worth it, in the end. I planned well so that I was not stressed in the lead-up and on the day of, in spite of the number of craft projects involved. I’m now working in the strategy department of a major national advocate for rare diseases. I’m doing some exciting things with the creation of a population health strategy for all rare diseases. It is intense and challenging work, but I’m loving getting to apply things I’ve learned in other professional settings to my health community. It’s also fantastic to be in an office of people who get it – they understand what my issues are and respect the concept of staying home when you’re sick. It’s been an unbelievable privilege to work with them. 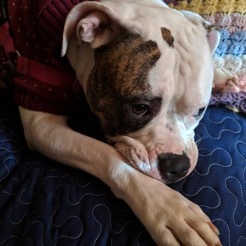 Suzie is a rescued American Bulldog and she’s a sweet, nervous girl with a lot of energy. She keeps us on our toes and gives great snuggles. It’s been a pretty good experience, but because of her past, she’s needed a lot of time and attention. The bulk of what happened to keep me away from IC for so long was a still-inexplicable fever episode this summer. For the better part of 2 months, I had a fever of 104 that we kept under control with steroids. I developed pretty serious neurological symptoms, including what they described as aphasia at the time, which was scary. I couldn’t express what I was thinking, in speech or in writing, which makes it incredibly difficult to manage a blog post. I wound up inpatient for the first time since 2004. And this time, it was at NIH. They put me through all sorts of testing only to wind up without any real answers. We’re still waiting for genetic testing to come back, but it seems that the answer is a viral infection that ran amok. I wish I had better answers, but sometimes in life you just have to roll with the punches. As a result of the final six months of 2018, I have decided my word for 2019 is healing. I need to reflect and take time to take better care of myself in all aspects of life. I look forward to sharing this journey with you here on Immune Competence. Like so many things, it’s a process. There will be good times and bad, but there will always be time for forward motion and time for reflection.